The competition in the pickup truck industry is stronger and stronger and all segments will soon see redesigned, updated or all-new models. The 2019 model year will bring to the full-size class redesigned Chevy Silverado, GMC Sierra and Ram 1500. However, one that missing is Toyota’s full-sizer, the Tundra. This model hasn’t seen the redesign since 2007 and with two updates Toyota is trying to keep this model competitive. But with recently refreshed F-150 and upcoming redesigns of Chevy, GMC and RAM models, Toyota must react quickly. Although Toyota made a number of changes on the 2018 Tundra, most of them are cosmetic while we appreciate the standard safety package. However, the model needs structural upgrades and Toyota promised it is working on updates of the body-on-the-frame models including trucks and SUVs. But Toyota hasn’t said when the new platform will be ready and when the all-new Tundra will arrive. We haven’t seen the prototypes of the 2019 Toyota Tundra yet and we don’t have the promise that this version will be all-new. After the 2018 refresh, we are sure that Toyota bought minimum one of two years before the redesigned Tundra arrives. Some reports, however, suggests, the introduction of the diesel option for the new model but Toyota hasn’t confirmed that. Toyota hasn’t surely updated the 2018 Tundra in order to announce the redesign of the 2019 Toyota Tundra. So, the upcoming version will return in the same form and we hope that we wouldn’t have to wait three or more model years for the redesigned model. The 2018 refresh brought new grille versions and updated headlights. The new TRD Sport package also brings attractive updates including the hood scoop, 20-inch wheels, monochromatic body, LED headlights and fog lights. The 2019 version will continue to live on these updates and we don’t expect new modifications. The model will again be available in the Double Cab and CrewMax options. The interior of the model will be a familiar story as we don’t expect changes inside. The Tundra offers plenty of space in all versions and has logically arranged controls. Considering its age, the model lacks the comfort and refinement relative to newer rivals but the model can be treated with the high-quality leather and nice interior pieces to provide an upscale feel. The Entune infotainment system will be available in all versions as well as the advanced safety equipment. Forward collision warning with automatic braking, automatic high beams, lane departure warning and adaptive cruise control will monitor all versions. Expect the same trim and package options as in the current version. 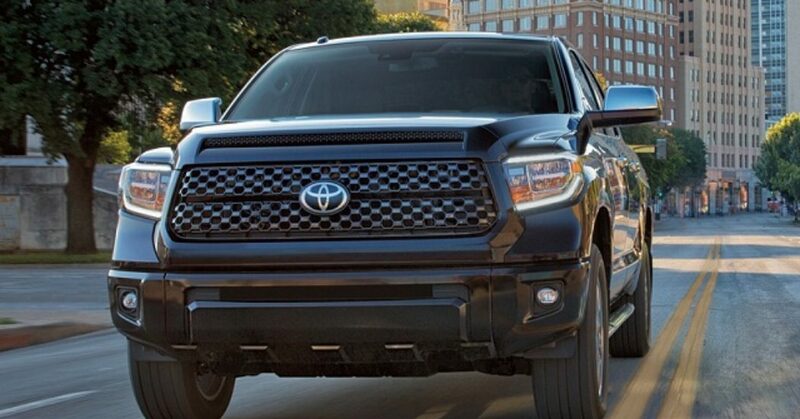 The 2019 Toyota Tundra will again rely on the strong but fuel inefficient V-8 engines. The base engine will remain a 4.6-liter V-8 with the capability of producing 310 hp and torque of 327 pound-feet. The 5.7-liter will up the ante with 381 hp and 401 lb-ft of torque. The transmission system for both engine options will be a 6-speed automatic while rivals already use the versions with 8 or 10 gears. Standard will be the rear-wheel drive and all-wheel drive options will come at extra cost. The diesel option has been mentioned in some reports for the 2019 Tundra. However, Toyota hasn’t confirmed and we don’t have new details about the diesel version. The 2019 Toyota Tundra is expected in late 2018. The price will be close to the current.